The next time someone complains that they can’t find any real country music, point them to any one of the 500 bluegrass festivals that take place each year. Or you could direct them to any one of the records that we survey in this edition of DisClaimer. Bluegrass albums are also where you’re most likely to find remakes of country classics. On the various CDs listed below, you’ll find new versions of “Tennessee Flat Top Box,” “Bye Bye Love,” “Americana,” “Don’t You Ever Get Tired of Hurting Me,” “Not Fade Away,” “Always Late,” “Let It Be Me,” “The Sweetest Gift,” “Crying in the Rain,” “All I Have to Offer You Is Me” and more. 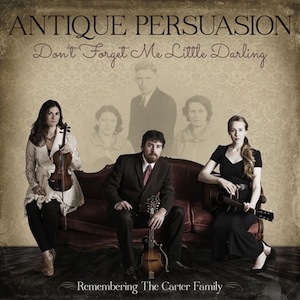 In fact, the DisCovery Award goes to Antique Persuasion, whose CD is nothing but remakes of Carter Family classics. 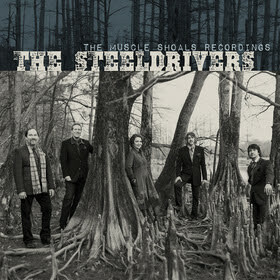 Nashville’s beloved The SteelDrivers released its fourth album last week, The Muscle Shoals Recordings. It wins the Disc of the Day prize. —He is already a member of the Bluegrass Hall of Honor, but Lawson is not resting on his laurels. His band remains the benchmark for tightly-rehearsed and flawlessly executed harmony singing and lightning-fast picking. The In Session CD kicks off with this, a track so rapid-fire that it practically gives you whiplash while listening. It has now become the group’s umpteenth journey into the bluegrass top-10. —This is a classic, high-lonesome sound. Gulley’s skyscraper-reaching tenor is surrounded by dazzling mandolin, banjo and guitar picking on this lead-off track of its new CD. The shower of notes is the aural equivalent of a fireworks display. Gulley can be a little flat and pitch-y at times, but with so much excitement raining down around him, who notices? —The group that brought us “Wagon Wheel” is marking time between full albums with a four-song EP. Its title tune is a raucous, rollicking celebration of a good-behavior time-out for prison conjugal visits. The Grand Ole Opry’s resident old-time music band is definitely raising eyebrows with this stomper. —Nowadays, we know comic actor Ed Helms for his long-running role on The Office, his spots on The Daily Show and his stardom in the three Hangover movies. But back in his Ohio college days at Oberlin, he was picking and singing with Jacob Tilove and Ian Riggs. The three have maintained musical contact ever since, and now they’ve recorded their first album together. The sound retains that good-time, collegiate, hootenanny, folk-bluegrass jam-session mood. —The listening party for this trio’s CD at Douglas Corner this month was one of those magical Nashville nights. I am doubly glad that I went because their spine-tingling vocal and instrumental ensemble work will only rarely be heard. Fiddler/singer Jenee Fleenor is on the road in Blake Shelton’s band. Brandon Rickman is on the bluegrass-festival circuit singing and picking with the Lonesome River Band. The divine singer-songwriter-guitarist Brennen Leigh plies her trade in the clubs of Austin and Nashville. She sings lead on this rippling title tune to their tribute CD to The Carter Family. Producer Jimmy Metts wisely lets their exquisite acoustic playing and flawless harmony singing lead the way. The result is an album that brings the Carters’ music renewed luster without being slavishly imitative. “Antique Persuasion,” by the way, is a play on A.P. Carter’s name. —Ronnie Reno is celebrating 60 years in entertainment with the release of his Lessons Learned CD. His accomplishments range from writing Conway Twitty’s 1978 hit “Boogie Grass Band” to hosting Reno’s Old Time Music cable show every Saturday night on RFD-TV. As the collection’s yearning, uptempo first single amply shows, he is still a hearty, sturdy presence as a singer-songwriter. Guests on the album include David Frizzell and Sonya Isaacs. —Chris Stapleton and Mike Henderson have departed, but this Nashville ensemble has lost none of its edge. Soulful Gary Nichols is more than up to the task of filling the fiery lead-vocalist slot. He also provides five of the new tunes. Founding fiddler Tammy Rogers has stepped up to the plate by co-writing five more, including this piledriving lament that kicks off the CD. I remain an enormous fan. —Brooke sings lead and Darin handles the deft guitar picking that this song requests. Originally a hit for Johnny Cash in 1962 and revived by Rosanne Cash (with Randy Scruggs on guitar) in 1987, it lends itself beautifully to a bluegrass treatment. An A-plus. Also check out their heart-stopping vocal duet on “Let It Be Me.” The album is called Snapshot. I call it essential. —These former IBMA award winners are back in the bluegrass top-10 with a breezy remake of this 1957 Everly Brothers classic. It’s jaunty and listenable, but the song is so closely associated with its original version that the only way to truly revive it would be to rearrange it far more radically than the Gibsons do. That said, the rest of the duo’s new Brotherhood CD is awesome. —This ditty hit No. 1 on the Bluegrass Unlimited chart last month. It’s a clever piece of songwriting wherein the protagonist loses his gal when he starts frequenting barrooms. “Love didn’t die a natural cause/It was honky-tonked to death.” Sisk’s countryboy voice is as comfy as an old shoe, and the track zips along with propulsion from banjo, mandolin and fiddle.